Why do we hear a lot about bird flu? This flu which started in Southeast Asia has now become a world threat. Even though this flu is in Asia people around the globe hear a lot about it on their radios and TVs. The reason is not because of what bird flu is now, but because it can become a pandemic flu. A pandemic flu is a flu that can spread world wide very easily because it can transfer from one person to another and can kill a lot of people. Today in Southeast Asia many people with the fear of this bird flu have stopped eating chicken. Many of the businesses with the chicken and its products have collapsed. Long Nguyen, a junior at Blair, whose aunt runs a restaurant in Vietnam which focuses mostly on chicken products, is now in a loss. “She has loans and a big debt. The noodles which she’s selling only taste good with chicken, and changing to another type of meat like beef or pork isn’t possible,” Long said. So she is hoping for the bird flu to stop so that she can get her money back. This flu is caused by the avian influenza virus which occurs naturally among birds. Avian influenza viruses do not usually infect humans, and also this virus is not a virus which can spread from one person to another right now. But still the flu can be in any part of the world through the migration of birds. 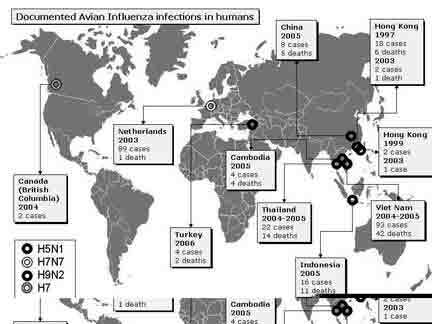 According to “World Health Organization “these wild birds carry viruses in their intestines, but usually do not get sick from them.” However influenza is very contagious among birds and can make some domestic birds, including chickens, ducks and turkeys very sick and kill them. People who are at high risk of getting this flu are the poultry farm workers and those who are in a close connection with birds. But can we eat poultry? “There is no danger in eating poultry,” said Dr. Julie Gerberding, Director of the Center for Disease Control. She also said that poultry cooked properly poses no health hazards as long as proper food hygiene practices are followed. So, we do not need to be worried about consumption of poultry. But she said to contact the local health organization if you find any sick birds. Bird flu may also affect other animals. “There’s a possibility of affecting the pigs,” said Mrs. Virginia Custer, Blair’s school nurse. In humans it also causes serious respiratory infections, “infections like cough, fever, pneumonia,” said Mrs. Custer. The big fear that scientists and health officials have is that the flu virus will change from a virus that is spread from animals to a virus that is spread from person to person. If that happens then it can affect millions of people around the world.